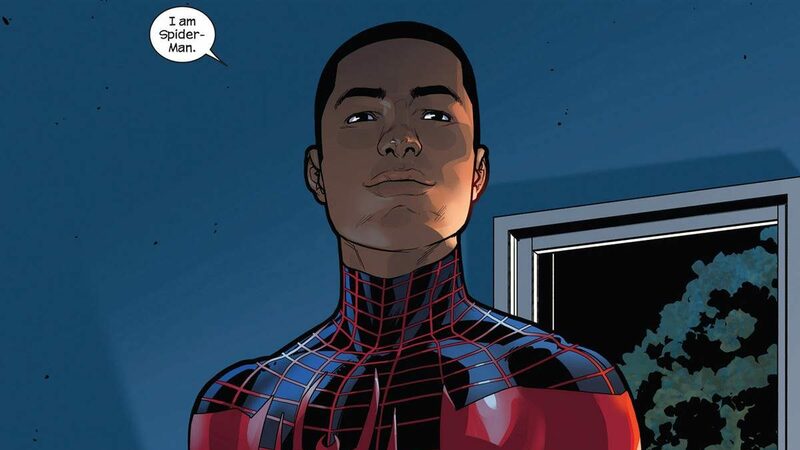 This week’s minorities in cartoons entry is Miles Morales, a Marvel Comics character. Miles is best known as being the Ultimate Marvel Comics line’s Spider-Man. Miles first appeared in “Ultimate Fallout” #4 (August 2011). Brian Michael Bendis and Sara Pichelli created Miles. Miles first appeared in the Ultimate Comics line, a line of Marvel comics set in an alternate universe. The line was hit-and-miss, as much emphasis was placed on making everything “modernized” and “edgy.” However, it often came off instead as crass or laden with cheap shock value elements. Fortunately, Miles was one of the Ultimate line’s few bright spots. This came from strong writing and avoiding the line’s “edgy” mandate. The Ultimate line’s other main success was the African-American Nick Fury. Miles’ backstory states he was the extremely bright son of a Latino mother and African-American father, and grew up in Brooklyn. Also living in Brooklyn was Miles’ uncle Aaron, who unknown to Miles was a master thief. One night, Aaron stole some materials from the abandoned-by-then Osborne Industries. The conglomerate was experimenting with trying to replicate Peter Parker’s spider-powers via genetically engineered spiders. Miles later visited his uncle against his parents’ wishes. Miles wanted to tell Aaron about having won the chance to go to a special charter school. However, one of the genetically-altered spiders had gotten into Aaron’s bag. The spider escaped and bit Miles. Miles later discovered he’d gained the traditional Spider-Man powers, plus a few unique ones. Initially, he only told his best friend and roommate, Ganke Lee. At first, Miles just wanted to be normal. After witnessing the death of his world’s Peter Parker, however, Miles decided he wanted to help others after all. He assumed (clumsily at first) the role of Spider-Man. Miles soon ran afoul of SHIELD and Nick Fury. They knew about his identity and his uncle’s criminal deeds. However, Miles eventually gained SHIELD’s blessing. Miles also had an encounter with his criminal uncle, who’d figured out Miles’ secret, and met the regular Marvel Universe Peter Parker. Since then, Miles became the most popular character in the Ultimate line, though the line itself eventually dwindled in popularity. Marvel decided to cancel the line completely, but saved its most popular character, Miles, by folding him into the regular Marvel Universe. They did this in the somewhat convoluted 2015 “Secret Wars” storyline, which saw multiple realities folded together. Miles’ introduction made news headlines, thanks to a version of Marvel’s most famous and prominent character having a non-White alter-ego. Miles’ introduction was met with much praise, though the usual online detractors complained about “political correctness.” Of course, the detractors said the same thing about John Stewart‘s introduction in the “Justice League” cartoon, but John’s introduction worked out well there. Said complainers also ignored A) real-life demographics, B) the need by comics publishers to appeal more to said demographics, and C) that the “regular” Spider-Man, Peter Parker, was alive and well. Outside of comics, Miles has gone on to appear in video games and on TV. Miles has appeared in the Disney XD animated series “Ultimate Spider-Man.” Actor Donald Glover voiced Miles.